Beijing, China (BBN)-Since the Beijing Olympics in 2008 Bolt has won every race he’s entered at a World Championship or the Olympics, with the exception of one, where he was disqualified for making a false start. When non-athletes want to run fast they set about moving their legs as fast as they can, so you might assume that Bolt has achieved this exceptional record by making his legs move faster than everyone else has, reports BBC. But this idea doesn’t stand up – in fact, it falls flat on its face. “Elite sprinters don’t swing their legs any faster than recreational runners,” says Dr Sam Allen of Loughborough University. “Elite athletes generate so much more power, owing to the fact they naturally have more fast-twitch muscle fibres. These elite athletes therefore spend a lot less time on the ground which results in them being propelled forward much quicker,” says Allen. Studies led by the American based researcher Peter Weyand have found that at top speed an elite sprinter’s foot will typically spend 0.08 seconds in contact with the ground at the beginning of each stride compared with about 0.12 seconds for an amateur athlete. Sam Allen says the fastest sprinters seem to be spend about 60 per cent of the time in the air, with no foot on the ground, while for amateur athletes it’s more like 50 per cent. 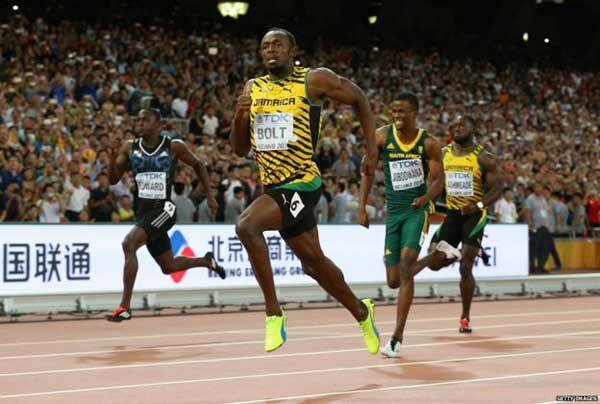 “Bolt is a genetic freak because being 6ft 5ins tall means he shouldn’t be able to accelerate at the speed he does given the length of his legs,” says former Great Britain sprinter Craig Pickering. Bolt typically completes a 100m race in about 41 steps – three or four fewer than his rivals. “Stride length is the biggest determent between a good sprinter who’s able to run under 10 seconds [in the 100m] and those sprinters who can’t,” Pickering says. Although good training can help all budding athletes be faster than they are, says Sam Allen, “the best sprinters will always benefit from having a huge amount of natural ability”. NextSecret to a super married life found: Have a second baby! Is crossing your legs bad for you?